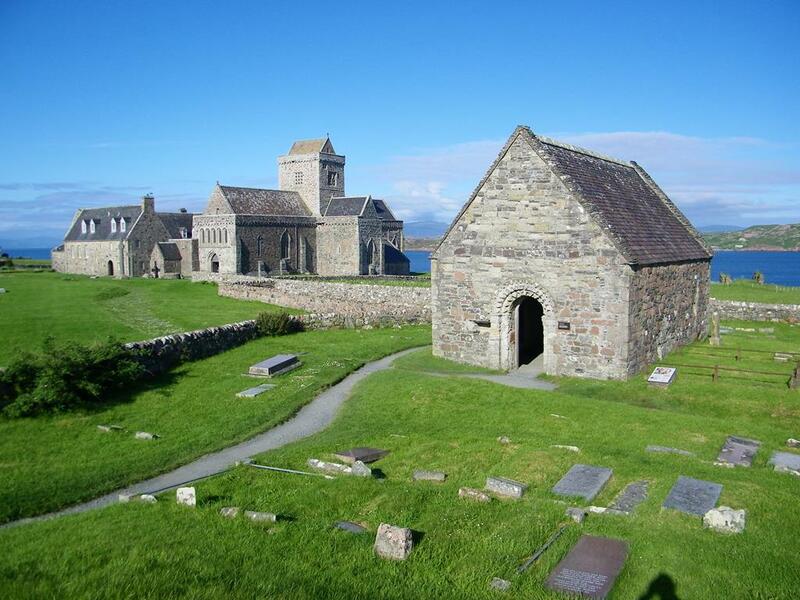 Iona,its Abbey, St Oran's graveyard a lasting symbol of Christianity in Scotland. 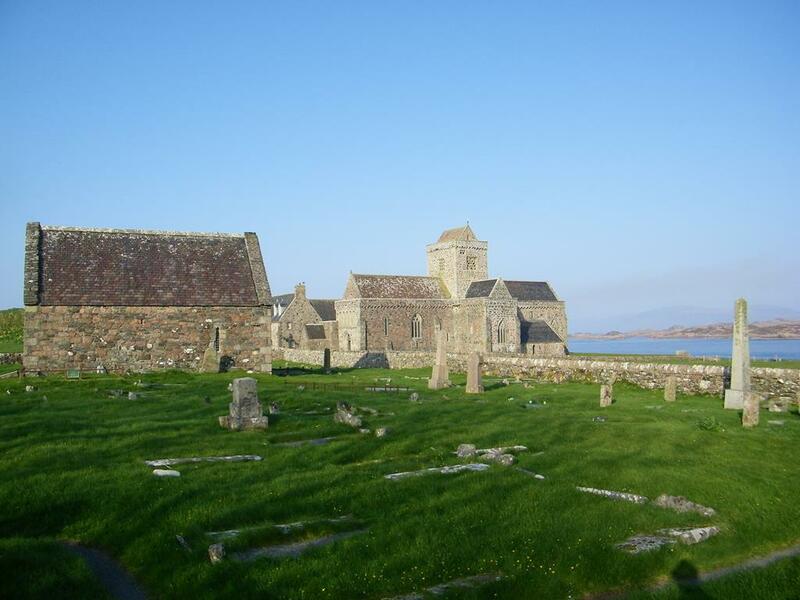 Iona, of all the many sacred places in Scotland is an enduring symbol of Christianity. 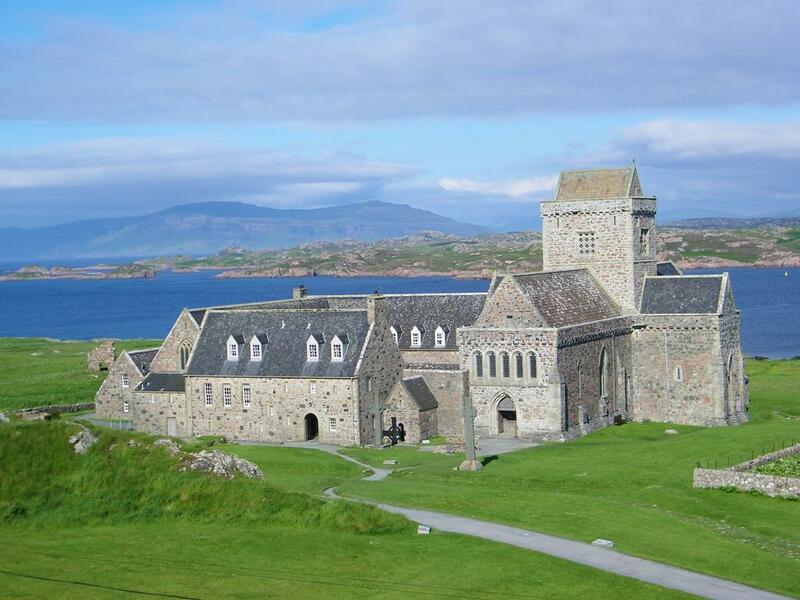 St Columba set foot on Iona in AD 563 accompanied by 12 companions and founded a monastery which became the heart of the Scottish Church during its early years. 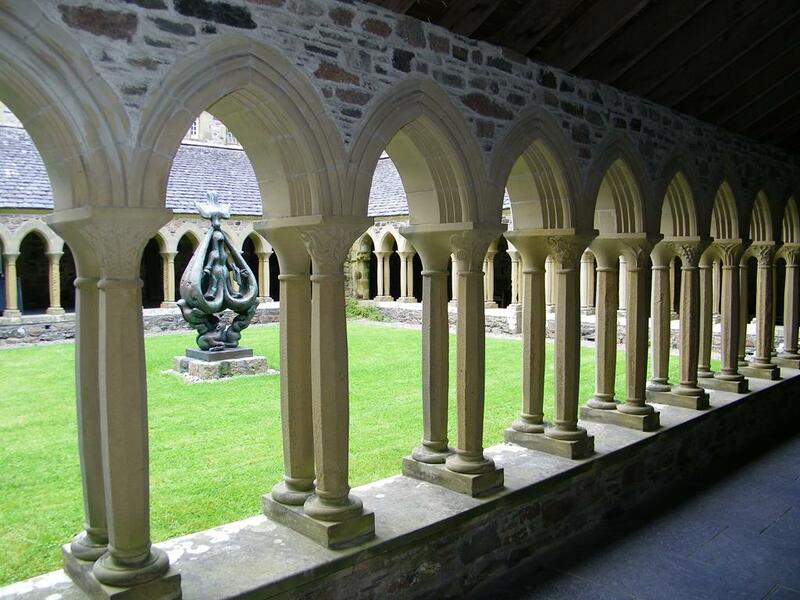 One of the most important monasteries in early medieval Europe, it was renowned as a centre of learning and artistic excellence with extensive international contacts. 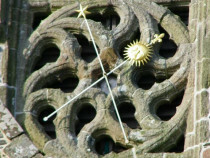 crosses that show the skills and learning within the monastery. 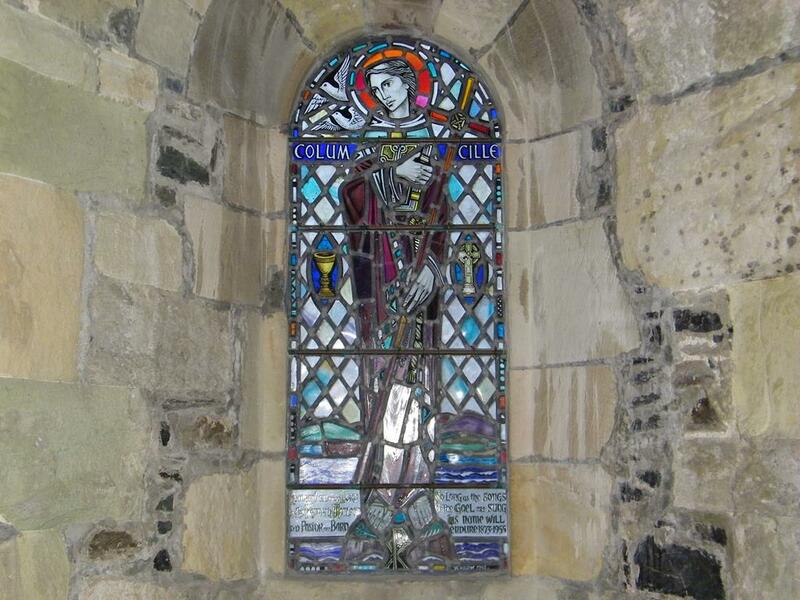 The foundations of the little stone oratory known as St Columba's Shrine may mark the original resting place of the saint himself, although historians maintain that his body was removed and taken to Dalkirk. The peaceful graveyard of Reilig Odhráin was the burial place of both monks and warlords in early times. 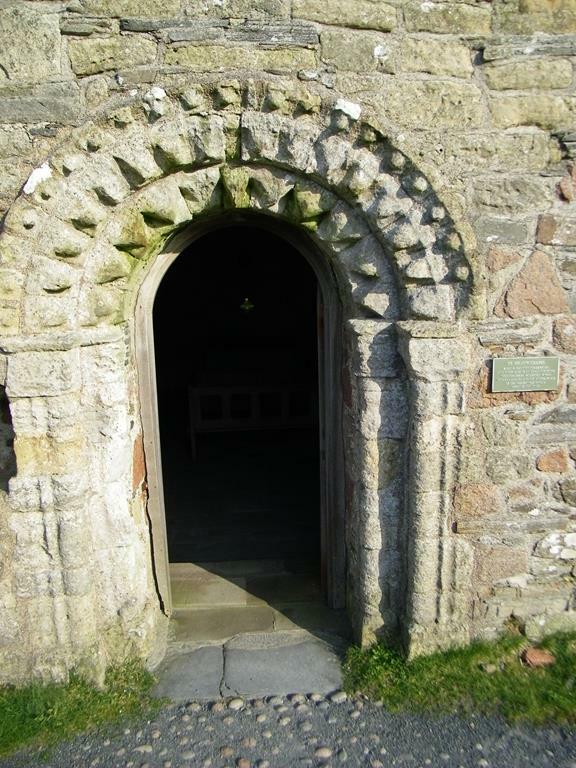 St Oran's Chapel was added in the twelfth century probably to house the grave of the great Somerled, 'king' or Lord of the Isles. 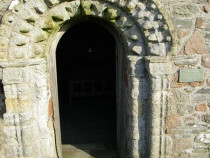 alongside the Nunnery, St Ronan’s chapel was rebuilt as the parish church. The paths between all these places of worship were well trodden from early times until present day by locals and pilgrims alike and a wayside prayer-cross, MacLean's Cross, was set up in the later decades of the 15th century at a point where the tracks meet. Around the same time, another bout of major building works got underway, with the aim of improving the Abbey Church and extending the domestic buildings of the Nunnery. But this new era of prosperity was not to last for very long. 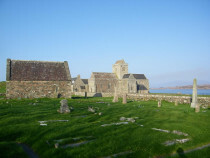 The Scottish reformation of 1560 ended monastic life on Iona and the Abbey and the Nunnery gradually fell into the picturesque ruins so popular with the tourists of the 18th and 19th centuries. 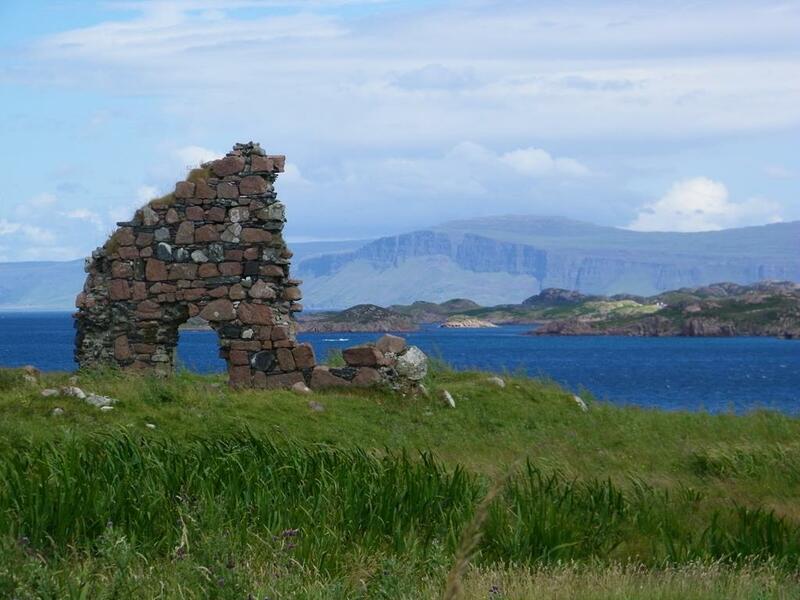 The Nunnery remains a ruin, but the Abbey has now been restored to new life by the Iona Abbey Trust and is now cared for by Historic Scotland. 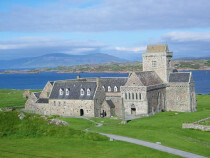 Iona Abbey tower sun dialcontinue the long tradition of pilgrims travelling to Iona from afar. Marble effigies commemorate the eighth Duke of Argyll and his wife. His wife has her crown on, he has none. This indicates that he was buried elsewhere while she was buried on Iona in 1925. You can see distinctive simple crosses carved on the inside of the church walls. 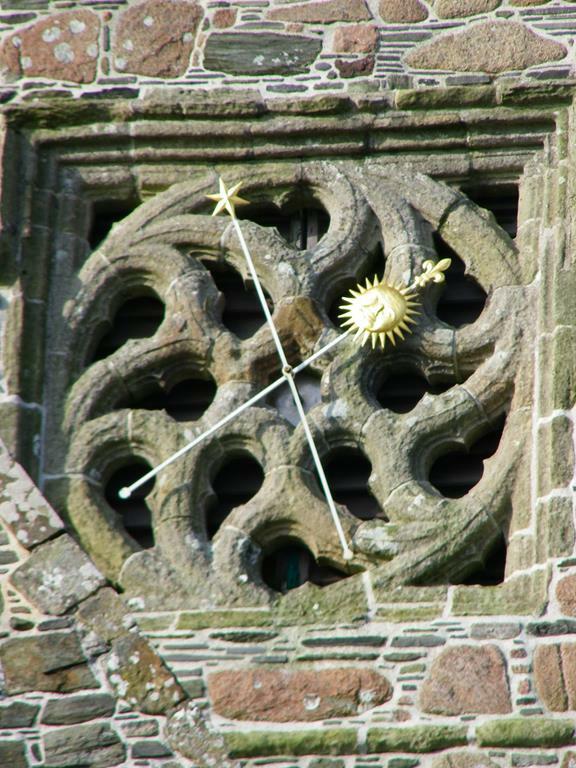 These were done when the church was consecrated. There are only 4 stained glass windows in the Abbey. These are of St. Margaret of Scotland, St. Columba, St. Bridget and St. Patrick. pillars. 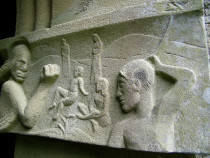 Depictions of contemporary life, including an armed rider & foot soldier and a cow killing scene. 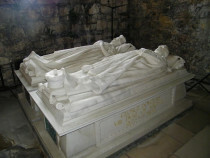 fifteenth century rebuilding, and the other Abbot John MacKinnon (1467-c.1498), the clan chief's son. 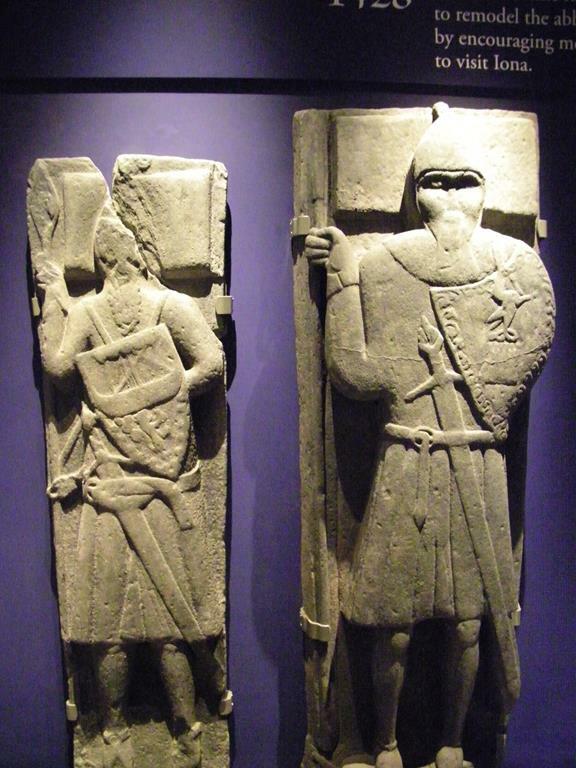 Around the walls of the cloister is a magnificent collection of West Highland grave-slabs. They represent a local style of West Highland stone carving developed on Iona during the 14th century, and are now known as “the Iona School” (see also Inch Kenneth). These stones commemorate leading members of West Highland families. 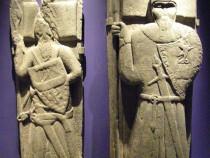 They have distinctive foliage-ornament and often swords and hunting scenes. 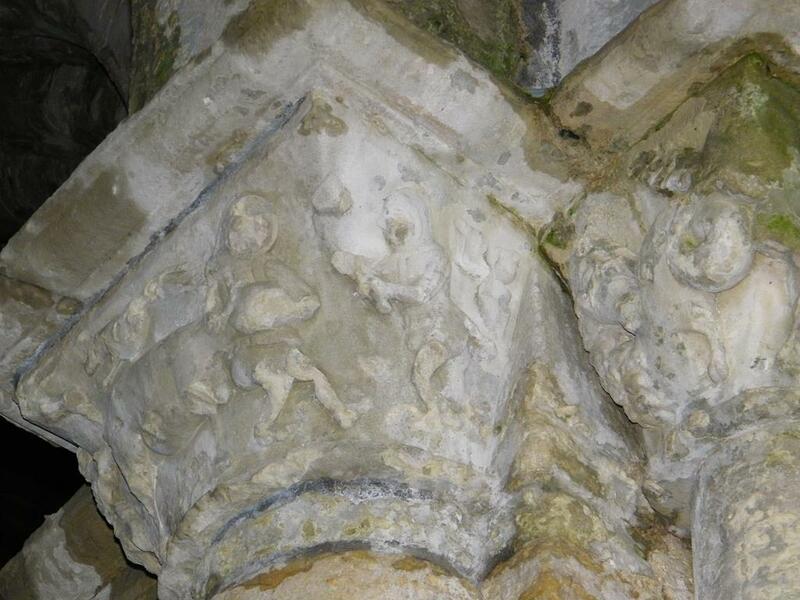 They were removed from Reilig Odhrain to protect the carvings. 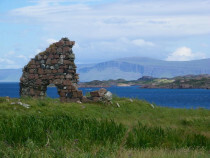 The earliest surviving stone building in the Abbey complex is St Oran's Chapel which may date from about 1180. 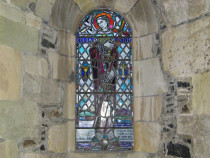 The chapel, restored in 1957, was probably built as a family burial chapel either by Somerled 'King of the Isles' who died in 1164, or his son Reginald. Later Lords of the Isles were also buried here. Irish influence can be seen in both the architecture and the decorative doorway of this fine building. 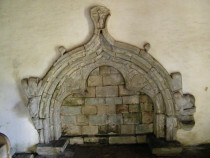 The hollow in the wall beside the doorway was made long after it was built, perhaps to hold a holy-water stoup. Inside is an elegant tomb-recess, built in the late 15th century, perhaps by John, Lord of the Isles. warlords from early times. 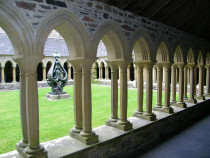 A plot dedicated as a graveyard would have been an important feature of the previous monastic site, though it may also have been used as a lay burial ground. There were many Christian memorials in the Reilig Odhráin. 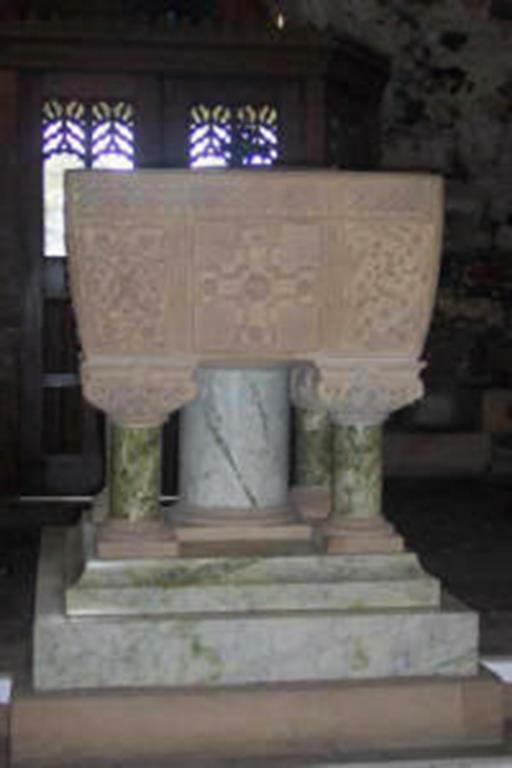 A survey in the late 1990's listed 10 crosses, 11 effigies and 150 grave covers and grave slabs. 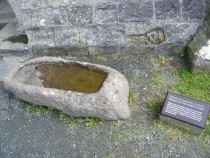 Some of these historic items are now in the Abbey museum and a few in the cloister. 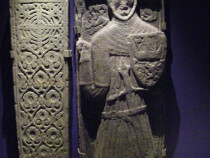 Fine medieval effigies and grave slabs once marked the burial sites of leading families of the Isles. 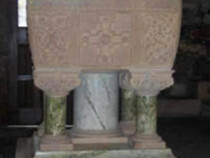 The oldest of the monuments were probably carved in the 12th century. 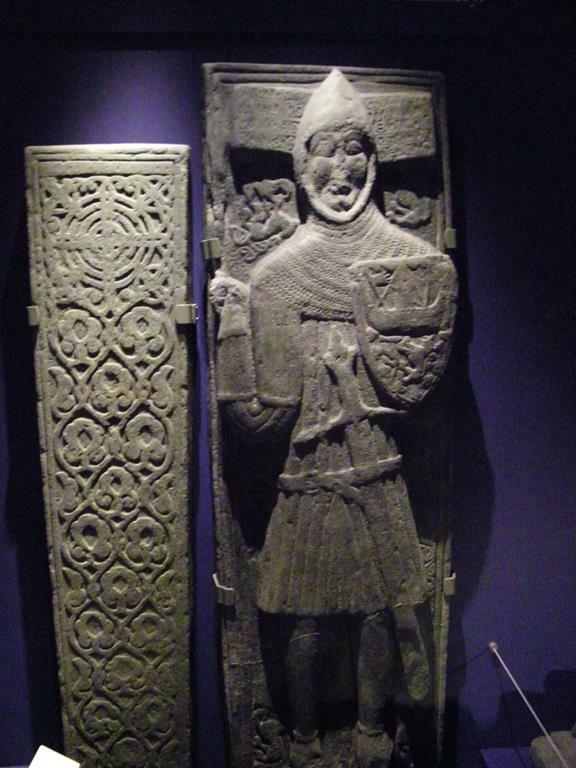 There is no direct evidence of the alleged earlier burial of Scottish, Norwegian and Irish kings, although there has long been a belief that 40 or more do lie under the turf surrounding the Abbey. The Labour Leader, John Smith, was buried here in 1994. It has also been the graveyard to local families over the centuaries. where coffins brought from the mainland were taken ashore until just over a hundred years ago.